ITD didn't work vs bosses. kissofaries wrote: ITD didn't work vs bosses. but "- to monster defence" works on bosses? - defense per hit works, yes. Crash wrote: - defense per hit works, yes. Can you please tell me which of these, if any, Labs I should use. Still searching for SU Lab. good enhanced damage, nice max damage, str bonus is a nice addition. Only missing + skills or a good proc on hit. It should be easy upgrade from TU as well. Nothing fancy on it, but just hitting 300 max damage and very high ED is good enough. Many crafts with other nice stats will struggle to get to 200% ed with MO. It is easy to forget about it, after chance that mo arent doubled for crafts, way harder to get capped ed. Hello, thanks for your guide, it's been great fun playing it especially since it's also quite nice for farming dunc etc. 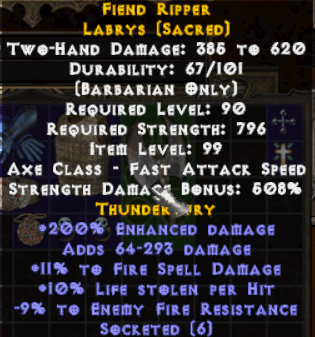 Just crafted this weapon. Should I even consider blessing it with weird shrine since it is already at 200 ed (can't go higher than that, right) or use a creepy/trinity shrine for blessing? Also what orbs should I put on it? Paladin wrote: Hello, thanks for your guide, it's been great fun playing it especially since it's also quite nice for farming dunc etc. Sadly that weapon is not too optimal, it has dmg, but nothing else. A good weapon should have skills and/or procs. It is fine to use if you dont have any better, but dont settle for that. Thanks for your reply, you are right, I forgot about that. Guess I was dazzled by the numbers. I'll continue crafting and use TU4 Labrys meanwhile.